‘Coconut Grove’. Say it out loud. It sounds idyllic, right? Well – it is as good as it sounds. Coconut Grove is Miami’s original neighborhood. However, its unique, laid-back atmosphere makes it more of a destination than a neighborhood. Let me tell you a little more about it – as I’m pretty sure that after I do, you’ll want to add it to your itinerary when you visit Miami. Coconut Grove is Miami’s original neighborhood. It was founded in the 1800s by what Coconut Grove itself describes as: ‘an eclectic mix of pioneers, intellectuals and adventurers’. Today it is home to around 20,000 people and still maintains a very welcoming and chilled atmosphere. It has attracted many well-known residents since it was founded. LeBron James, Madonna, and Sylvester Stallone in recent times. As well as former residents from earlier times including, Tennessee Williams, Robert Frost, David Crosby and Alexander Graham Bell. It is a tropical neighbourhood in every sense of the term. 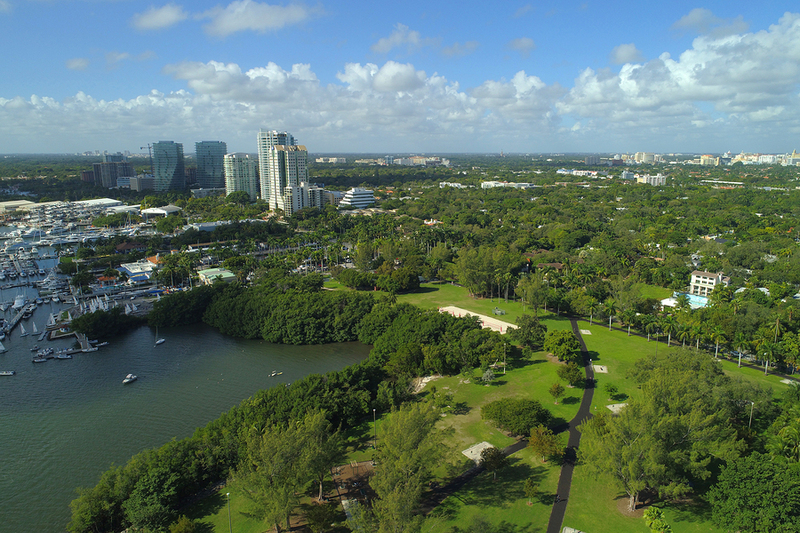 It has a lovely green landscape, which meets the waters of the Biscayne Bay. As you walk, you always seem to be covered by a canopy of lovely trees and there’s a warm breeze – even on the hottest day of the year. Given its background, Coconut Grove has plenty of history to investigate. Some of that history includes places like the Barnacle State Park, Vizcaya Museum and Gardens, Miami City Hall and The National Tropical Botanical Garden – The Kampong. As well as exploring the historic attractions mentioned above, there’s also the more modern and now legendary CocoWalk – one of Miami’s go to destinations for fine dining and entertainment. It’s not your average mall, however. It was built to blend in and compliment its surroundings in Coconut Grove, and it does that beautifully. It’s also home to high-end retail shops and individual boutiques as well as a luxury movie theater that serves the very best wine and beer. How Gray Line Miami can help you see Coconut Grove Miami. It’s fair to say, like most Miami residents, we love a trip to ‘The Grove’. We’ve included it in the itinerary of our New Miami City Tour. If you’d like to join us, we’ll pick you up from your downtown or Miami Beach Hotel in our executive minibus and we’ll take you on a memorable tour of Miami’s top attractions – including our world-renowned collection of Art Deco architecture and Miami Beach. Then we’ll travel the Venetian Causeway where you’ll hear about Miami’s famous residents of the past and present, and on to Coconut Grove – with a stop at CocoWalk, the neighborhood’s wonderful shopping and entertainment destination. After that it’s onto Coral Gables and Little Havana.